Which airline has the best inflight wi-fi? How do the major U.S. airlines compare in their in-flight Internet service? That’s what the folks at HighSpeedInternet.com were wondering, so they studied Wi-Fi availability, speed and cost for the seven largest carriers to find out. 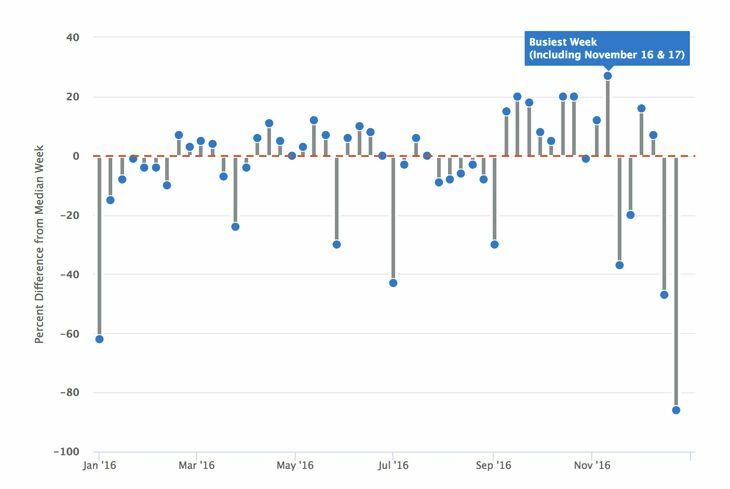 Capturing first place in their overall rankings was JetBlue, partly for its speed, but mainly for its cost: There is none. As for availability, Virgin America was tops, with Wi-Fi offered on 100 percent of its available seat-miles. Delta was second at 98 percent availability, followed by Southwest at 90 percent. Virgin America also had a speed of 15 Mbps, but its superior Wi-Fi comes at a high price — $25 a day, the most expensive in the industry, the study noted. Keep in mind that the cheapest way to buy Gogo is to purchase hourly ($7) or day ($19) passes ahead of time. 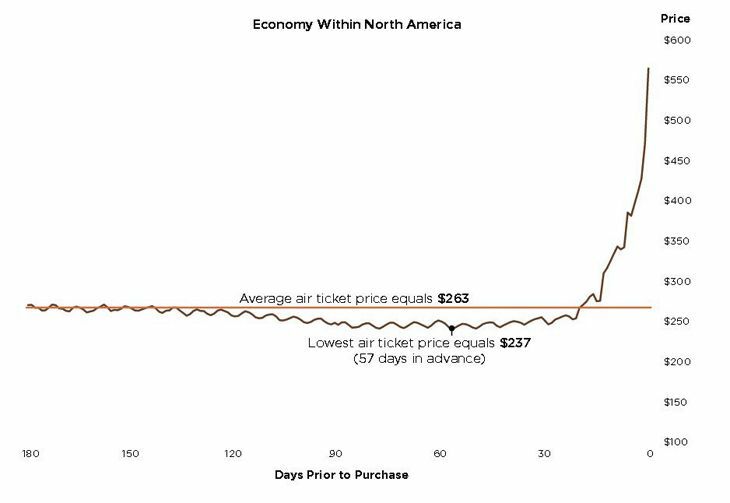 When you purchase on the plane, the cost can soar to as high as $50. 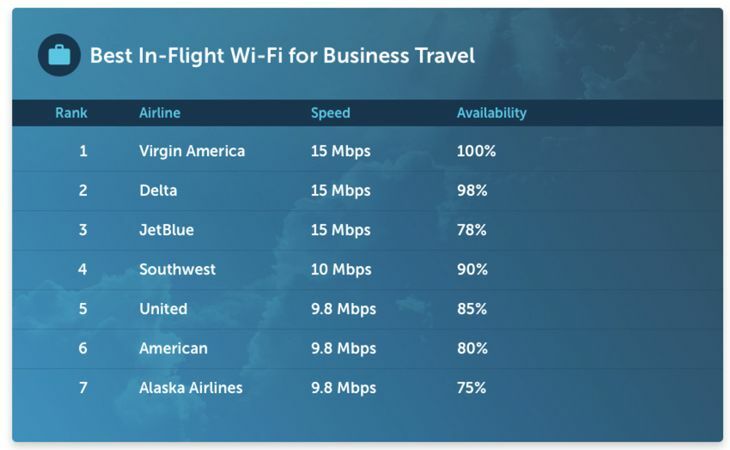 Virgin’s owner, Alaska Airlines, didn’t fare as well, with Wi-Fi available on just 75 percent of its capacity – the lowest of the seven airlines – and speed well behind Virgin America at 9.8 Mbps. At the bottom of the company’s overall rankings was United, with availability of 85 percent, speed of 9.8 Mbps, and a cost of $20. United was just below American, which had similar numbers. HighSpeedInternet.com noted that Hawaiian, Spirit and Frontier Airlines don’t have in-flight Wi-Fi. As a frequent United flier, this finding surprised me— When the system is actually working, United’s inflight wi-fi is relatively fast and stable. But the problem is reliability– over the last year, I would estimate that United’s inflight wi-fi system was down on about 40% of my flights. The rankings changed significantly in looking at the best Wi-Fi service for business travelers, with the assumption that the cost is irrelevant because the traveler’s employer will cover it. If that’s the case, HighSpeedInternet.com gives top honors to Virgin America for its top speed and 100 percent availability, followed by Delta and JetBlue. In conducting their research, HighSpeedInternet.com staffers discovered that some of this information wasn’t as easy to find as they had thought. 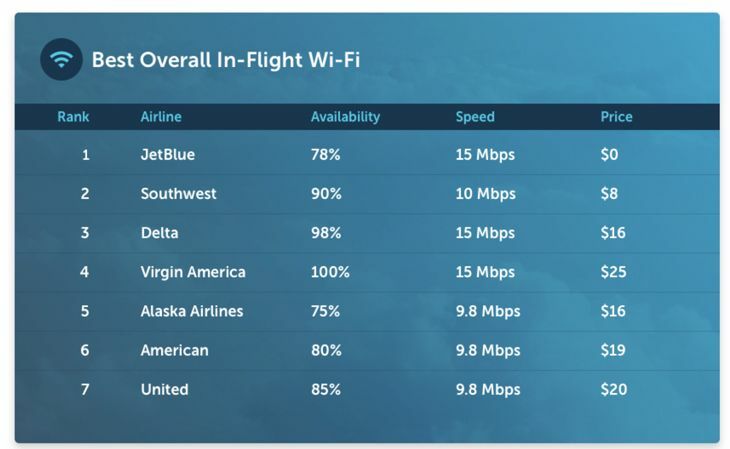 Any report on airline Wi-Fi quality and cost should also note that this is all subject to change in the months and years ahead as carriers continue to upgrade their products due to consumer demand. For instance, we just reported on how Gogo is shifting much of its in-flight Wi-Fi service from ground-based to satellite-based links, which will greatly increase speed and data capacity. And we also reported that Air Canada will soon make inflight wi-fi free for its elite level members. Do you use inflight wi-fi much? How is the service on the airline you fly most? Does it align with these findings? 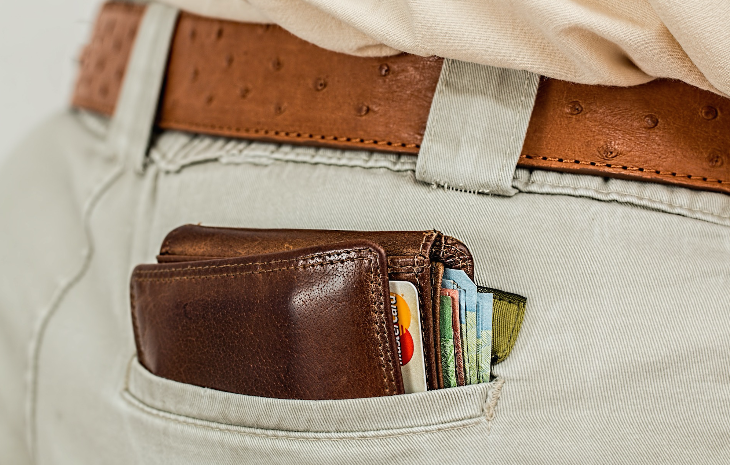 In its latest annual study of hotel loyalty programs, WalletHub found significant differences in the value of rewards and the rules governing the plans. Which one is best for any given individual depends on which aspects of a program the traveler values most, and how much he or she spends on hotels in a year. The company examined the loyalty programs of the 12 largest U.S. lodging groups, and scored them on 21 different metrics. Overall, it rated Wyndham Rewards as the best loyalty program for the third consecutive year. Why? For one thing, “Wyndham Rewards offers the most redemption flexibility, allowing members to book award nights at consistent point values and without brand restrictions,” a WalletHub spokesperson said. But other hotel companies’ programs have their own distinct advantages. For instance, the geographical coverage offered by Marriott Rewards is tops for international travelers, since it has participating properties in 126 nations. Hilton’s Honors plan has the most travel partners – 49 in all – making it the best program for pooling and transferring points, WalletHub said. In other categories, Best Western is the only chain whose points don’t expire when the loyalty member shows no account activity. And La Quinta members get the best return on their spending, with an average reward value of $13.65 per $100 spent. 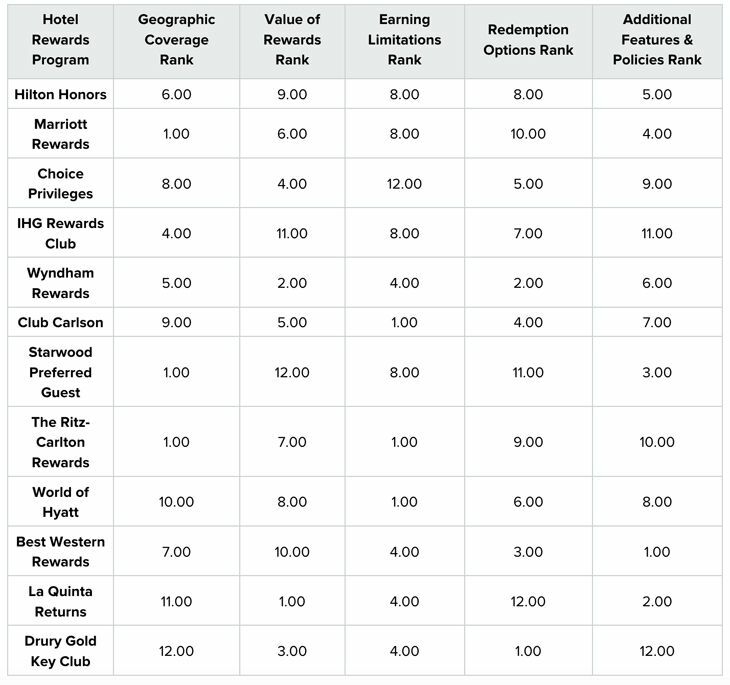 On the other end of the scale, the Starwood Preferred Guest ranked 12th out of 12 in the value of its rewards (i.e., return on dollars spent), and in 11th place for the variety of redemption options. You can see the study’s full results here, including a calculator that lets you see the best program for you based on your annual hotel spending level. Has ride-sharing giant Uber jumped the shark? If there’s one thing Uber has monopolized in the past few years, it’s negative publicity – everything from driver problems to management turnover to sexual harassment, not to mention vitriolic opposition from licensed taxi drivers and city officials in many places. 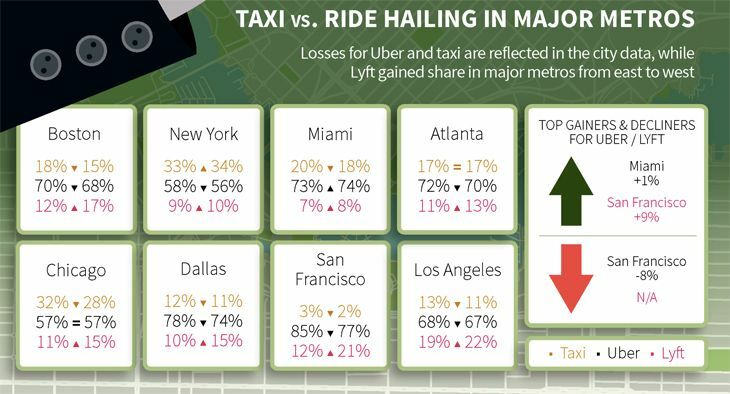 Still, Uber has surged ahead in market share everywhere it went, blowing taxi companies out of the water and facing little significant competition in its app-based business model except for Lyft – and Lyft has been running a distant second. But that could be changing. 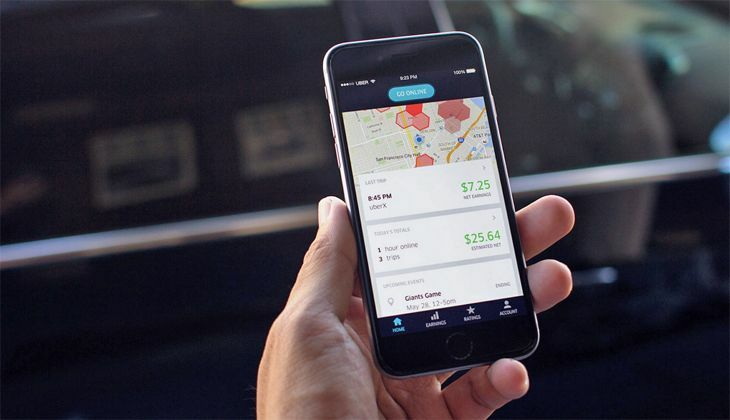 Certify, which provides business travel expense management software for companies, has started to see some weakness for Uber’s business. 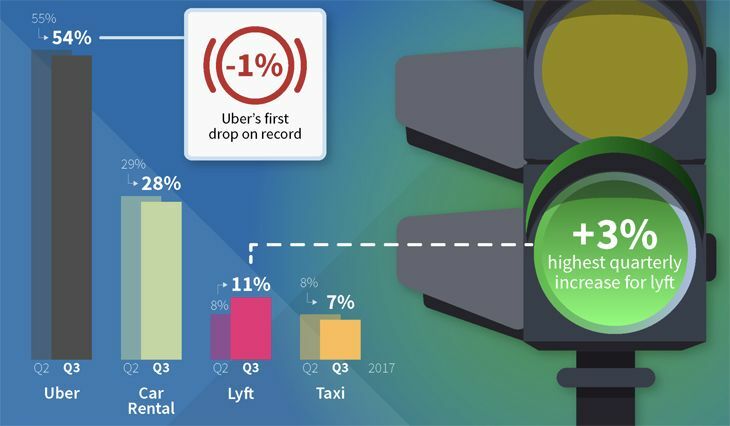 In San Francisco, where both companies are based, Certify tracked the biggest third-quarter decline in Uber’s local market share – down 8 percent – and the biggest gain for Lyft, up 9 percent. “The number two ride-hailing provider (i.e. 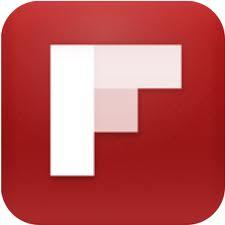 Lyft) also improved in user review rankings, reaching 4.76 stars to Uber’s 4.1 and taxis’ 3.59,” Certify said. Overall, Uber’s share of ground transportation spending in the third quarter dropped one point from the previous quarter, to 54 percent – its first drop ever – while Lyft’s share rose 3 points to 11 percent. Car rental companies’ share dropped a point to 28 percent, and taxis fell from 8 to 7 percent. Another interesting Uber factoid emerged from the Certify study. The new Uber feature that allows customers to tip their drivers through the app is “off to a slow start,” Certify said: Only 3 percent of Uber riders used the tipping feature, giving drivers an average tip of $3.10. 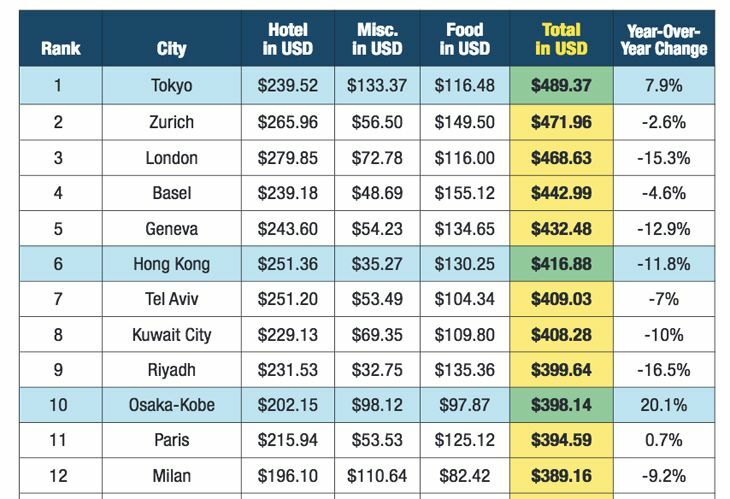 If you click on the link to the report in the previous paragraph, you can scroll down to see business travelers’ third quarter spending percentages on specific brands of restaurants, airlines, hotels, and rental car companies, and the average spend per transaction for each one. Readers: Have your ride-hailing preferences changed between Uber and Lyft? If so, why? Which one is your favorite? Disclosure: Lyft has sponsored the TravelSkills blog within the last year but did not sponsor this post. For a long time, it has been part of air travel orthodoxy that it’s always a lot less expensive to buy a roundtrip ticket to your destination than two one-way tickets. But times are changing. A new study from the Airlines Reporting Corporation – which serves as a clearinghouse for all travel agency ticket sales – determined that old belief “is simply no longer true” in many cases. This was no small-time analysis: ARC said it evaluated three years of data covering more than 350 million tickets. It found that since 2014, the so-called “one-way fare premium” – i.e. 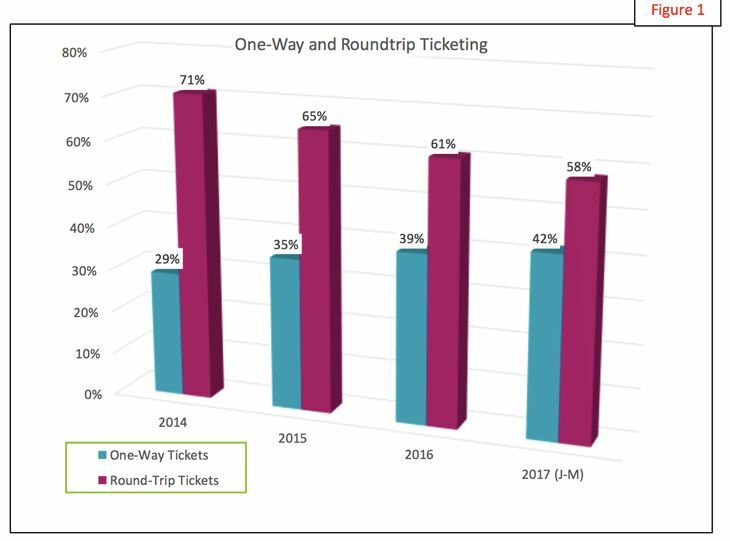 the increased cost of buying two one-way tickets vs. one roundtrip on the same itinerary – has shrunk to nearly zero in almost one-third of the 200 busiest U.S. air travel markets, whereas in years past it would have cost as much as 50 percent more for two one-ways vs. a roundtrip. The one-way premium remains stubbornly in place in other markets. 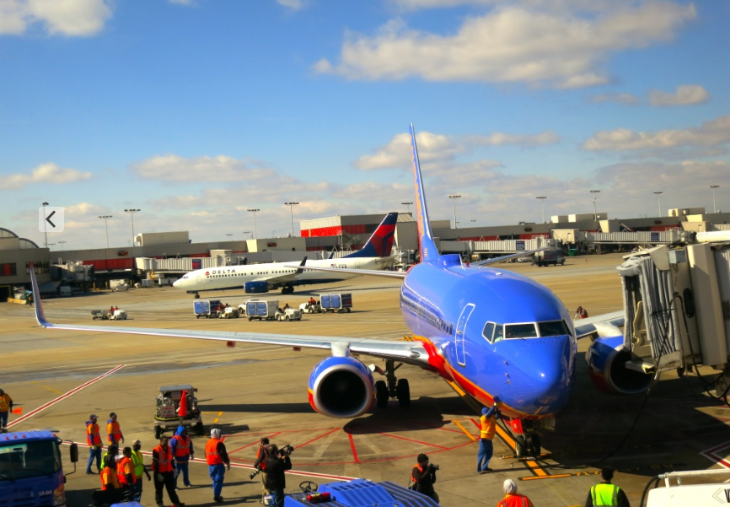 ARC said that was the case for selected markets including flights to and from San Francisco, Minneapolis, Philadelphia, and Washington Reagan National, among others. In those markets, “the one-way premium has been around $50 per direction and has remained largely unchanged over the study period,” ARC said. But it dropped dramatically in other select markets, including flights to and from Newark, Dallas/Ft. Worth, LaGuardia, and Los Angeles, the study found. 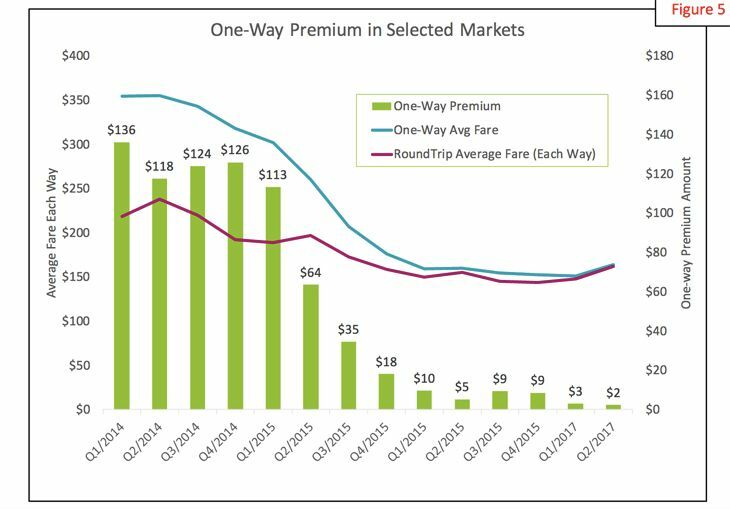 For some markets, like Denver and Boston, the one-way premium stayed in place for flights to or from some destinations but dropped off in others. 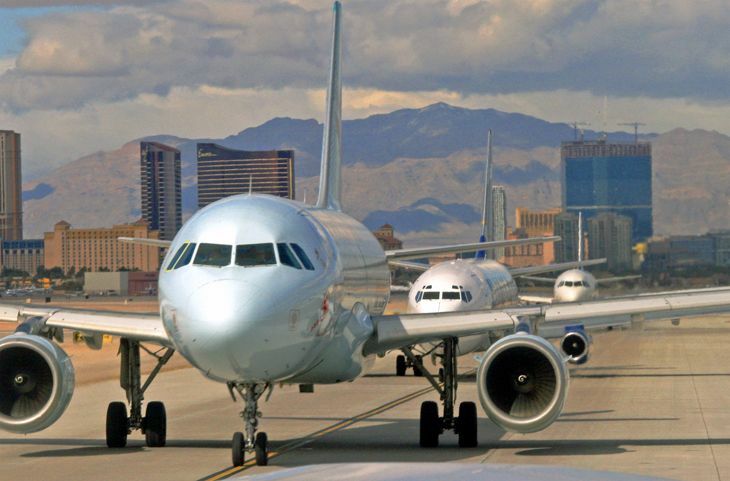 “The effect is based on market and not individual airports or airlines,” ARC noted. As the cost differential withered away in many markets, ARC noted a corresponding shift in traveler purchasing practices: The percentage of one-way tickets sold jumped from 29 percent of all tickets in 2014 to 42 percent so far this year. But that increase was not equal among all market segments. ARC said most of the increase in one-way ticket purchases came from leisure travelers and unmanaged business travelers (i.e., those who make their own purchase decisions without any company rules or guidelines). 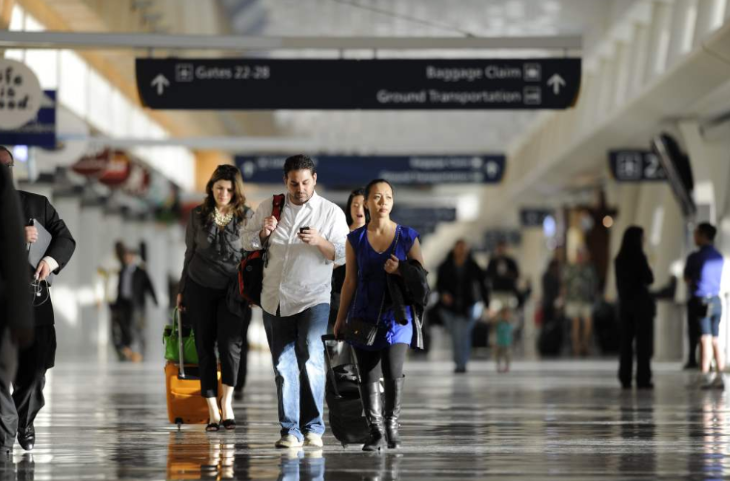 For “managed” business travelers, the shift to more one-way ticketing “has been almost non-existent,” ARC said. But it also noted that the shift to a greater percentage of one-way ticket purchases held true no matter how far in advance the tickets were bought. 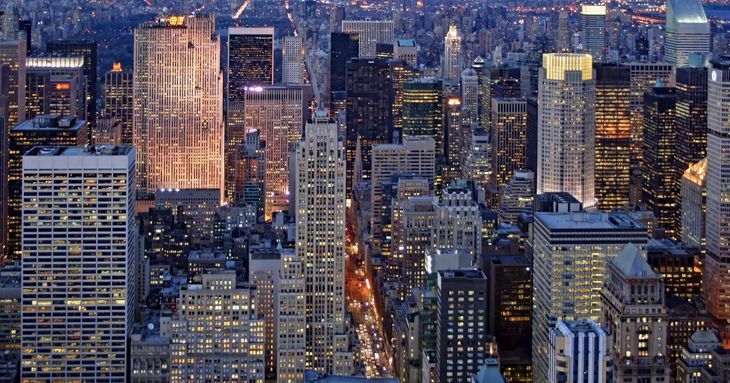 “While there are many reasons behind when and how travel is ticketed for corporate travelers, there may be situations where opportunities are missed for increased flexibility and even travel cost savings. By looking deeper into the options for one-way tickets cost savings and other benefits may be available to travelers,” ARC said. Readers: Do you always check out both one-way and roundtrip pricing? Which do you usually buy? Do you have any tips or tricks to share on the issue? Southwest Airlines’ Rapid Rewards program last week was named Program of the Year in the annual Freddie Awards, and a new study from MileCards.com suggests part of the reason why it won. 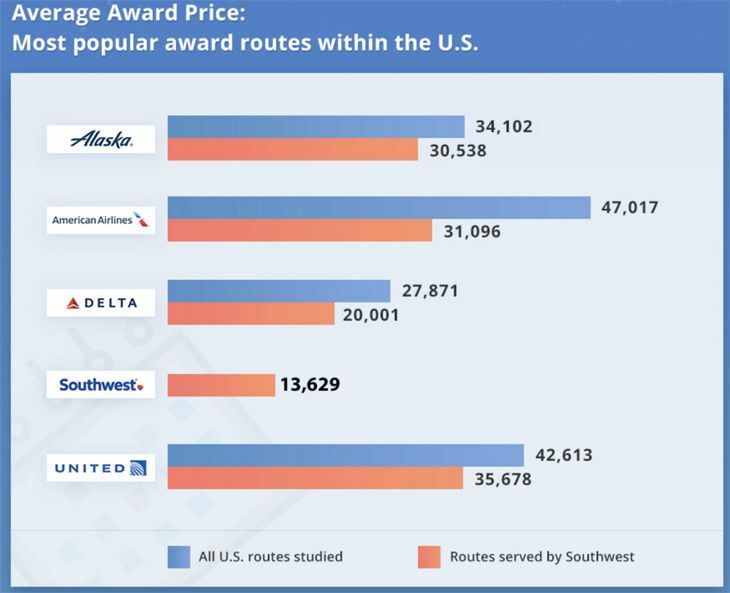 The study found that the cost of a Southwest domestic reward flight is lower by far than the other four largest airlines, and the availability of the lowest-cost “saver” awards is far greater on Southwest as well. As for the availability of the lowest-cost “saver” awards, MileCards.com found that Southwest had them on 95 percent of the days checked, vs. 76 percent for Delta, 62 percent for Alaska, and just 48 percent for United and American. Speaking of Hawaii – one of the most popular award travel destinations – the study found the lowest-cost award flights on Alaska, averaging 54,618 roundtrip. Delta wasn’t far behind at 57,020. “American AAdvantage charges the most, with an average price of 97,375 miles, and only 6% of dates available at the ‘Saver’ level price of 45,000 miles on its own flights,” MileCards.com said. See the full Milecards study here. 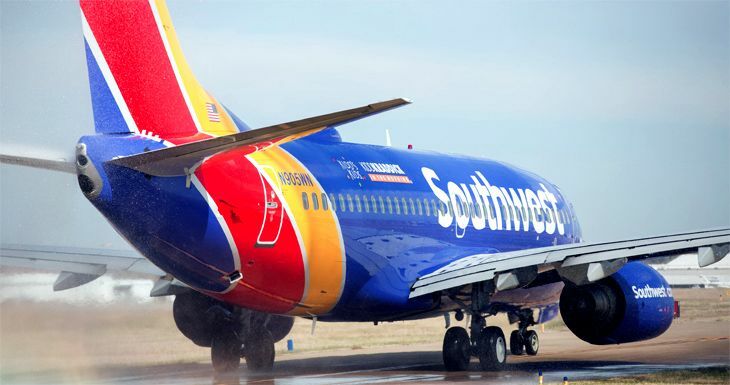 Southwest’s Rapid Rewards program ties award travel costs to the prevailing air fares available at the time of travel, and thus doesn’t issue an award price chart. Delta took some criticism a few years ago when it stopped publishing a SkyMiles awards chart, but MileCards.com suggests that there are positive and negative aspects to Delta’s strategy. “Now, domestic economy coach tickets (on Delta) can be found on many routes for just 10,000 miles roundtrip, and others at 15,000 miles roundtrip, while others cost more than the old 25,000 mile standard. By doing this, it has better flexibility to come closer to matching the point prices of Southwest, which doesn’t publish a menu of award prices,” MileCards said. As for United, the study suggests that MileagePlus members are better off saving their miles for international rather than domestic award flights because they’ll get more value out of them. The study praised American’s AAdvantage program for allowing members to change the dates of award travel for no fee, if it’s done 21 days in advance and costs the same. The study turned up one interesting nugget about the best days to travel on award tickets: You’ll find the best deals for flights on Tuesdays, with an average cost of 30,574 miles; the highest average costs were on Sundays at 41,332 miles. What’s the best “deal” you’ve found using miles recently? The worst deal? Please leave your comments below. Now that you’ve saved up thousands of miles/points for your summer vacation, do you ever stop to consider strategies for stretching them the farthest? Or do you just book the flights you want and pay whatever it costs? A new study from personal finance website NerdWallet suggests that the value of your points/miles can vary considerably depending on whether you book economy vs. premium class, one-way or roundtrip flights, and how long your flight is. 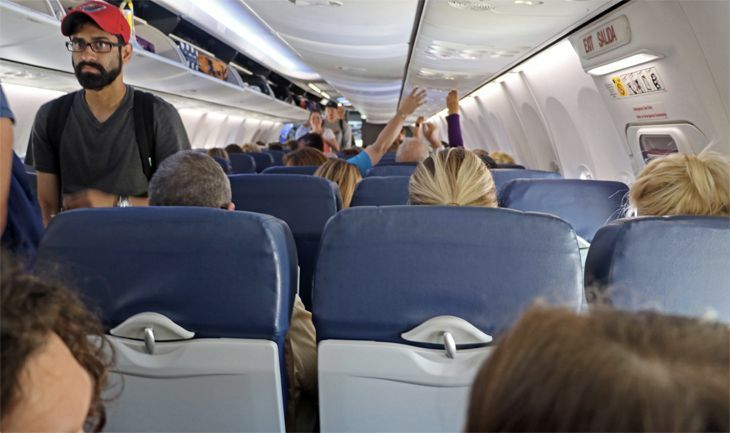 For instance, the study found that frequent flyer points (NerdWallet refers to both points and miles as “points” for consistency) are worth significantly more for domestic travel when you book an economy seat as opposed to business or first class – unless your flight is a long one. Points used to book domestic roundtrip flights in economy were worth 1.03 cents for travel during peak periods, or 1.08 cents for off-peak, NerdWallet found, while the corresponding values for premium seats were 0.83/0.86 cents. 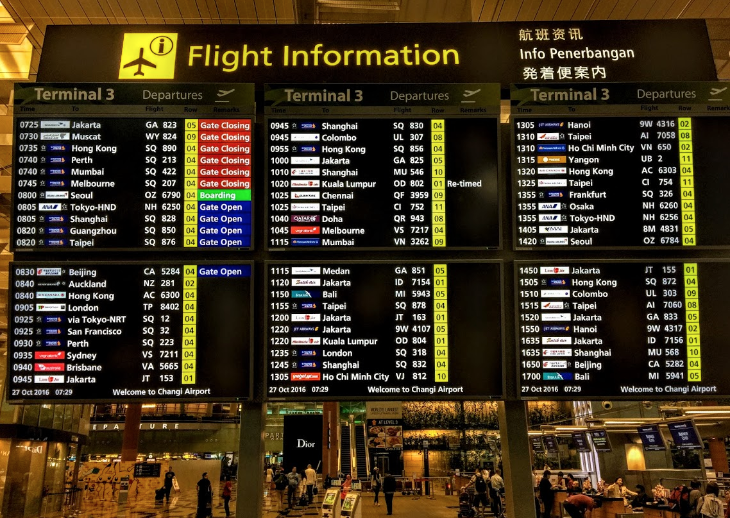 “If you prefer to fly business, you might want to pay cash, or save your points for an international and/or one-way flight,” NerdWallet said. However, the study also found a big discrepancy in point values for booking premium cabins based on flight distance. On flights of less than 1,000 miles, points had an average value of 0.72 cent, vs. 1.13 cents for flights longer than 1,000 miles – a difference 10 times larger than that for economy flights. 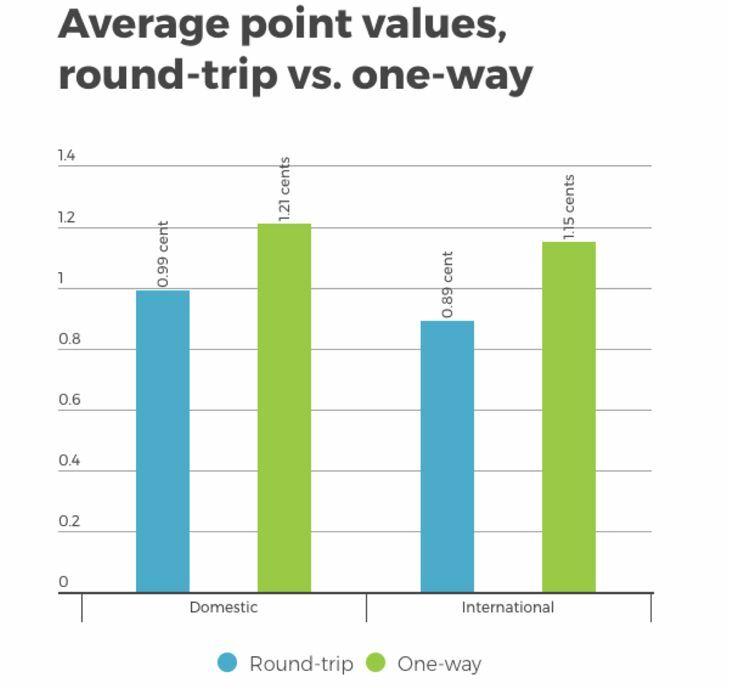 Another finding that might seem counter-intuitive is that you get more for your miles/points when you book one-way flights vs. roundtrips. 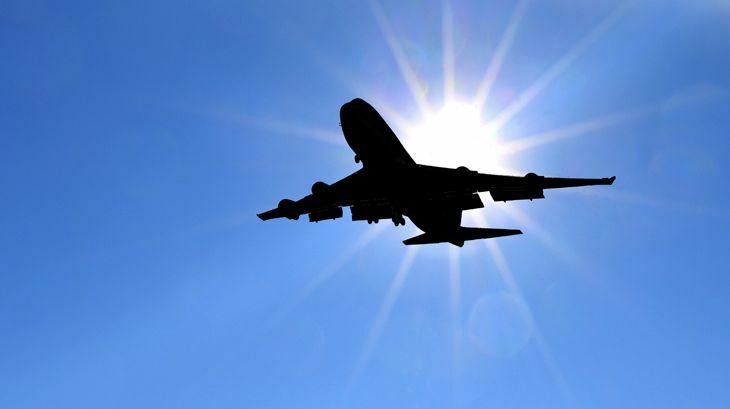 In 62 percent of the trips that NerdWallet studied, one-way flights had higher point values than round-trips. 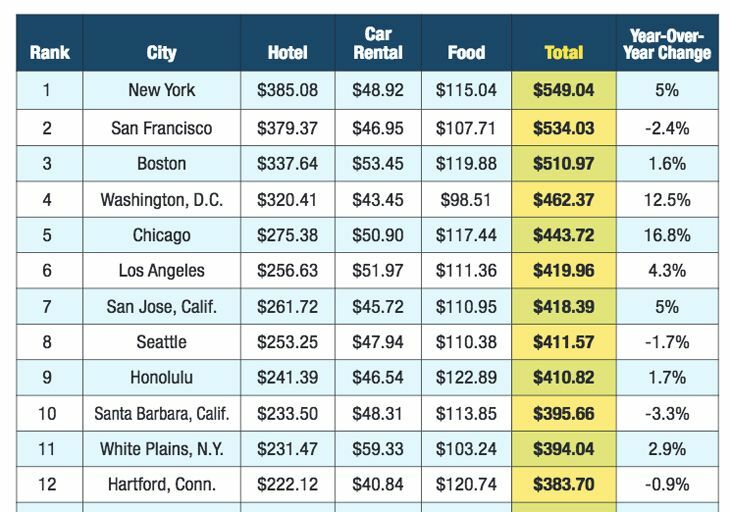 “In most cases, if you’re paying with points, the price of a one-way trip is half the cost of a round trip. When paying with cash, however, one-way generally costs more than half the price of a round-trip ticket. Therefore, per-point values are higher when flying one-way,” the company said. See full Nerdwallet study here. “The trip will likely cost the same number of points overall. But you’ll have flexibility, allowing you to go home earlier or later than you planned, or continue your adventure in another city or country,” said NerdWallet’s Sean McQuay. 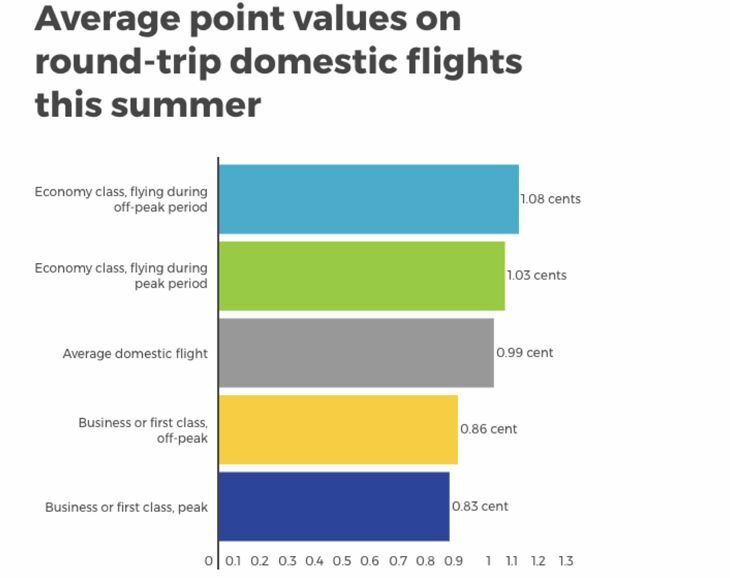 For domestic trips, the average point value for one-way flights was 1.21 cents, vs. 0.99 cents for roundtrips (the average for all classes of service). The gap was even greater for international travel – a value of 1.15 cents for one-way travel vs. 0.89 for roundtrips. To determine the value of your points for a specific trip, divide the cash price by the number of points required; you’ll generally get a result somewhat higher or lower than 1 cent per point. “As a simple rule of thumb, if the value of each point is less than 1 cent, use cash and keep your points for a higher-value opportunity,” McQuay said. But he adds that there are times when it’s a better strategy to pay with points/miles even if their value is relatively low. One time is when your points/miles are nearing expiration. Another is in the event you might have to change or cancel your flight – because change fees for tickets bought with cash are generally much higher than those for tickets paid with points. Readers: What’s the best “deal” you’ve snagged on an award trip? Please leave your comments below. Is this really the best frequent flyer program? 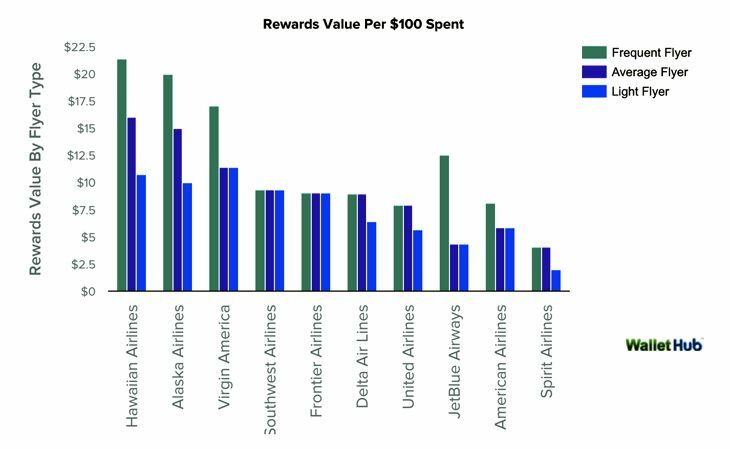 An annual analysis of airline loyalty programs by Wallethub.com finds that for frequent travelers – which it defines as those who spend an average of $5,743 a year on air travel – the three best options are Delta, Alaska Airlines and JetBlue. We have heard readers remark that “Delta’s the best airline with the worst frequent flyer program,” but this is the second year in a row that Delta’s SkyMiles topped the Wallethub results in its overall score – not just for frequent travelers, but for average and infrequent travelers as well. 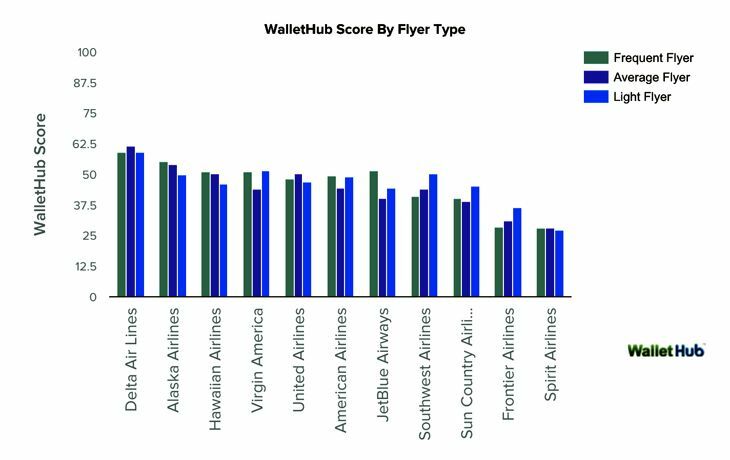 The Wallethub study is noteworthy for its comprehensiveness – it uses 23 different metrics to evaluate programs of the 11 largest domestic airlines; it breaks down results according to the amount of money a traveler spends on air fare each year; and it works with a sizeable team of academics and experts. It even offers a calculator where you can enter your air travel budget and get a recommendation of the loyalty programs that are likely best for you. Of course, frequent flyer programs are a moving target for comparative analysis these days; American’s AAdvantage just this month transitioned from a mileage-based to a revenue-based model, like several of its major competitors; and Virgin America’s Elevate program is in the process of being merged with Alaska’s Mileage Plan. Still, the Wallethub experts do their best to make their comparisons meaningful. 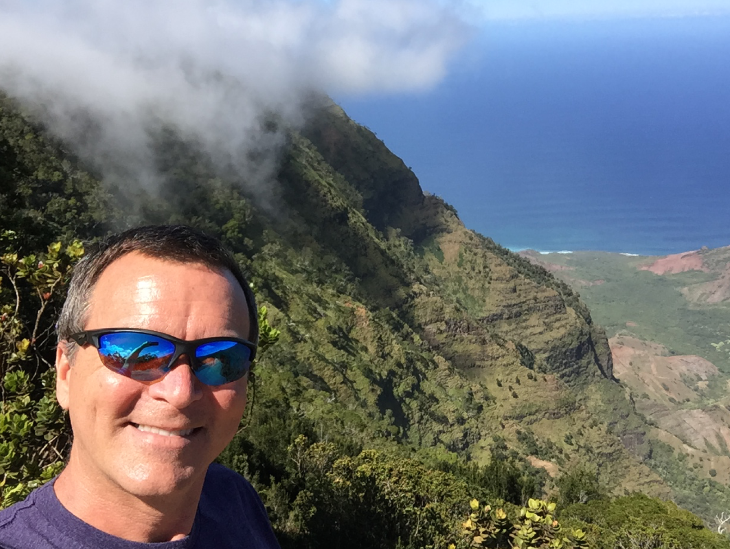 In looking at rewards value for frequent travelers, Wallethub.com found that Hawaiian Airlines offered the best return, at $21.38 per $100 spent. Alaska ranked second at $19.96, followed by Virgin America at $17.02. The results vary considerably based on which of the study’s metrics you look at. For instance, United outdistanced all its rivals in the number of airline partners in its program (39, vs. 28 for Delta and 24 for American). But in “ease of achieving elite status,” the unlikely winner was Frontier, achieving the maximum possible score of 3.0, followed by Spirit and Hawaiian at 2.47 each, then JetBlue at 2.43; by comparison, Delta’s score was just 0.35, American’s was 0.71 and United’s was 0.96. Another interesting tidbit from the study: Buying miles to top off your account may be expedient, but it’s not necessarily a good deal. Miles cost an average of 62 percent more than they’re worth when you buy them rather than earn them by flying, the report noted. Click on the link above and you can see the full results, including that interactive calculator and a comprehensive chart that shows how each of the 11 airlines scored on each of the many metrics in the study. What’s the best frequent flyer program for you? Do you love em, or hate em? Meals & snacks in coach: Which airlines are best for you? 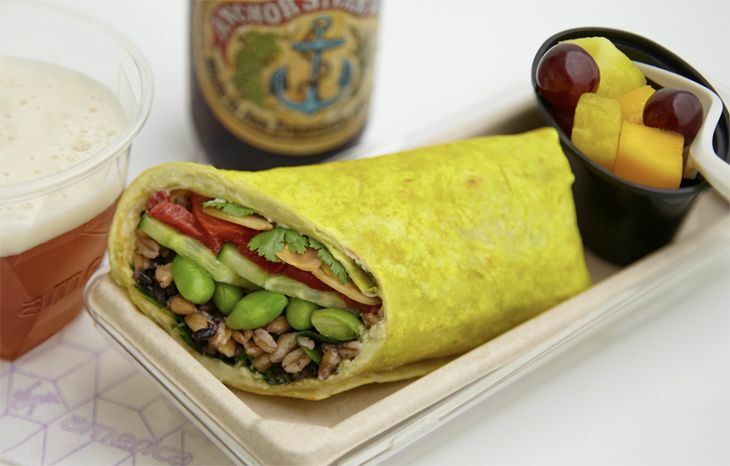 A nutritionist rates Virgin America’s and Delta’s main cabin food as the healthiest. Do you care about the calories and nutritional content of the food and snacks you eat on airlines? 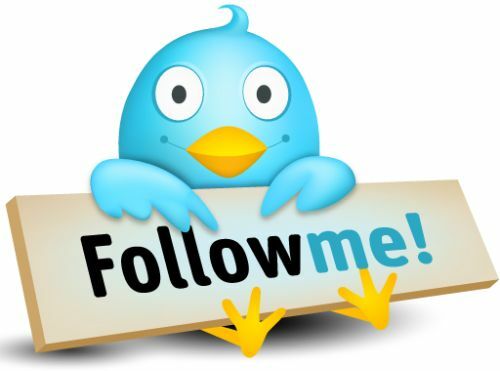 Charles Platkin PhD does. He’s a nutritionist with the online nom de plume ‘The Diet Detective’, and his latest annual study of airline food content for economy class travelers has Virgin America and Delta ranked at the top. Virgin America’s offerings rated 4-1/4 stars overall in his study (on a 1 to 5 scale), while Delta pulled down 4 stars and a “most improved” designation. The bottom-dwellers in the study were Frontier and Spirit, each earning just one star and a “shame on you” catcall. 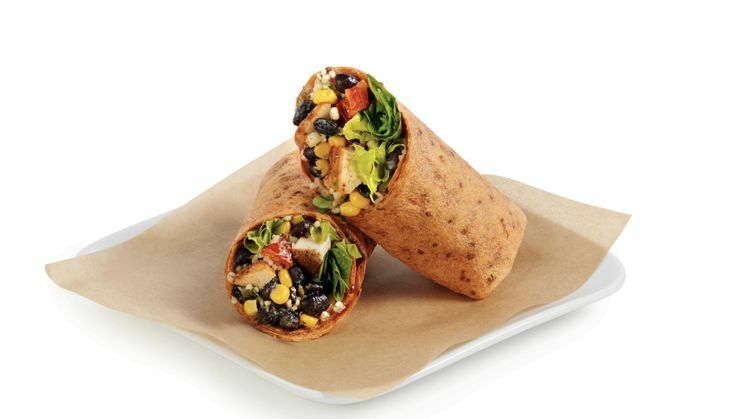 Air Canada matched Delta in earning 4 stars; ratings for other airlines were 3.75 for Alaska (making us wonder whether Alaska’s or Virgin’s menu planners will dominate after their merger); 3.5 for JetBlue; 3.25 for United; 3 for American; 2 for Southwest (peanuts, anyone? ), 1.75 for Hawaiian and Allegiant; and 1 for Spirit and Frontier. For serious foodies, the best thing about the Diet Detective’s research is the comprehensive nutritional information he provides for every individual snack and meal offering on every airline, including calories, fat, sodium, protein, carbohydrate and fiber content, along with the number of minutes you’d have to walk to burn off each item. He also provides caloric totals and general conclusions for each carrier. Click on the above link to this year’s study and you’ll see what we mean. Readers: Do you care about the content of economy class food items? 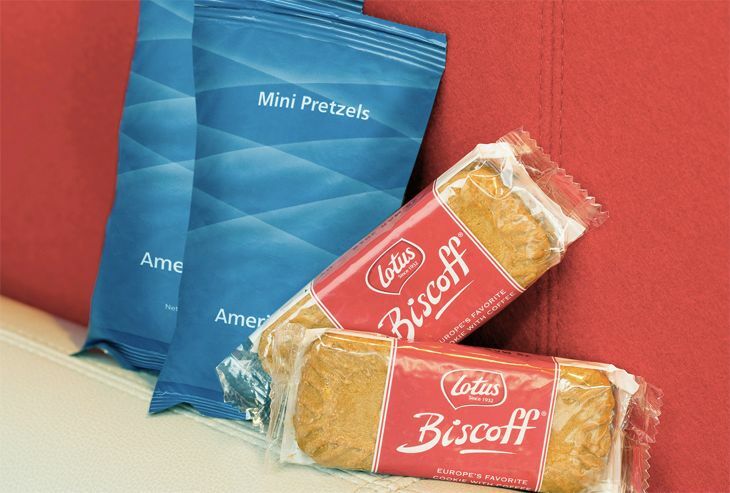 What’s your favorite single snack or meal, and on which airline? How often will you be able to find a domestic airline flight that is cheaper than low-cost Southwest? According to a new study, the answer depends on whether or not you check a bag. You might recall that Southwest has clung tenaciously to its longstanding policy of allowing its passengers to check up to two bags for free – putting it at odds with its competitors (and with the wishes of Wall Street analysts, who would like Southwest to get in line with the industry in order to boost its fee revenues). Topaz International, which specializes in travel expense auditing, has come out with a new study that found Southwest’s reputation as the lowest-priced option doesn’t really hold up for many business trips – although it is doing better than it was four years ago. But it is generally the better deal for most leisure travelers. And what’s the difference? Checked bags. Topaz studied base fares plus bag fees in 97 domestic air travel markets, looking at comparable flights offered by Southwest, American, Delta, United, Alaska, JetBlue, Frontier, Spirit, and Virgin America. Still, Southwest appears to be making progress even with business travelers. 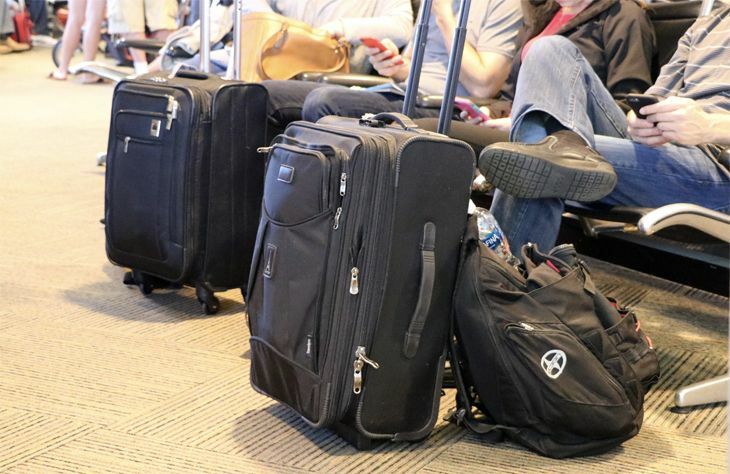 While competitors beat Southwest’s fares 45 percent of the time in this year’s study when no checked bags were involved, that’s a drop from 60 percent in the firm’s 2012 study. You can download a copy of the new study here. Do you fly Southwest much? Do you check bags when traveling on business? Please leave your comments below. Secrets of air rage revealed! A newly published academic study looked into the factors that make air rage more or less likely to happen on any given flight – and the results were not what the researchers expected. The researchers from the University of Toronto and Harvard Business School got access to internal reports on air rage over several years from “a large international airline,” and they found that the biggest predictors of passenger misbehavior fit right into the theme of a Bernie Sanders campaign speech. Flights with a first class cabin had an air rage incident rate of 1.58 per 1,000 flights, the study found – more than 10 times the rate for flights with no first class (0.14 per 1,000 flights). As for boarding, the odds of an incident in the economy cabin more than doubled when everyone boarded from the front of the plane. 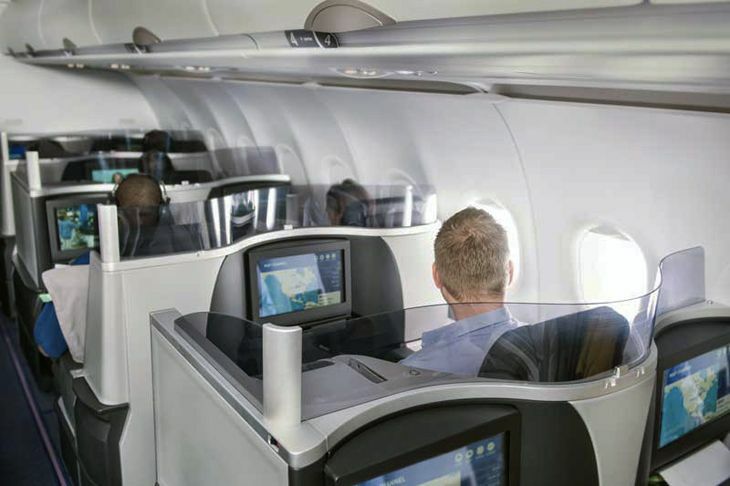 One of the researchers told the Toronto Star that passengers don’t mind front-cabin flyers getting better treatment, but they don’t like it to be too obvious. “People have paid between several hundred dollars to several thousand dollars, and they don’t want to be made to feel like second-class citizens,” said the University of Toronto’s Katy DeCelles, an associate professor at the university’s Rotman School of Management. She said airlines could probably reduce air rage by eliminating factors that make passengers more aware of the preferred treatment that first class passengers get – e.g., putting curtains between the cabins, using dual boarding areas, and making sure that meals being cooked in first class can’t be smelled in coach. 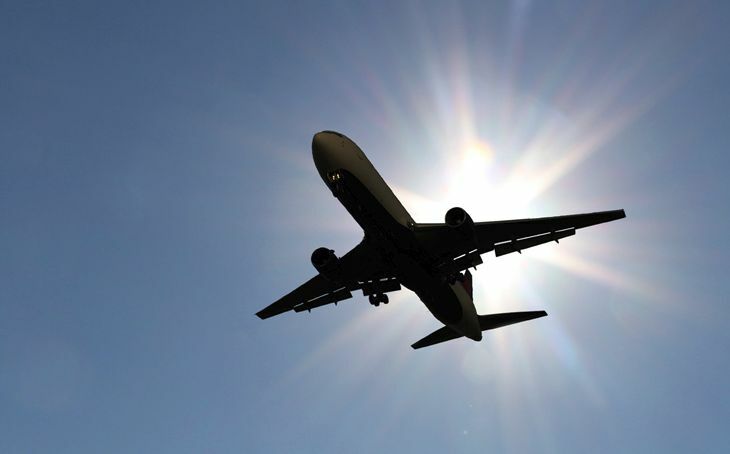 A new study by the online travel giant Expedia finds that the average price of an airline ticket has dropped significantly this year — although more in some places than others. And it predicts a continuation of that trend in 2016. Adjusting for exchange rates, Expedia said that during the 12-month period from October 2014 to October 2015, average economy class ticket prices worldwide dropped by about 8 percent. The declines were even bigger in July and August, with year-over-year drops of 13 and 10 percent respectively. For trips within North America, the reduction was slightly smaller — an average decline of 5 percent through the first 10 months of 2015, Expedia said. The change was much more dramatic across the Atlantic: The average price of economy class tickets for intra-European travel was down 17 percent this year vs. the first 10 months of 2014. Ticket prices from North America to the Asia-Pacific region were down 13 percent from a year ago, Expedia noted. The study also determined the relative savings available from advance purchase. Looking at tickets purchased at least 21 days before departure, Expedia found that the average cost savings was 31 percent for intra-North American economy travel and 27 percent for premium seats. From North America to Europe, there was a 21 percent savings in economy and 20 percent on front-cabin seats. Looking ahead to 2016, the Expedia analysts predict that “prices will continue to trend downward as airlines continue to add capacity,” although it did not estimate how much they might decline. The company said it has introduced a new consumer feature: a tool (“powered by a proprietary statistical model”) that customers can use during their fare searches. 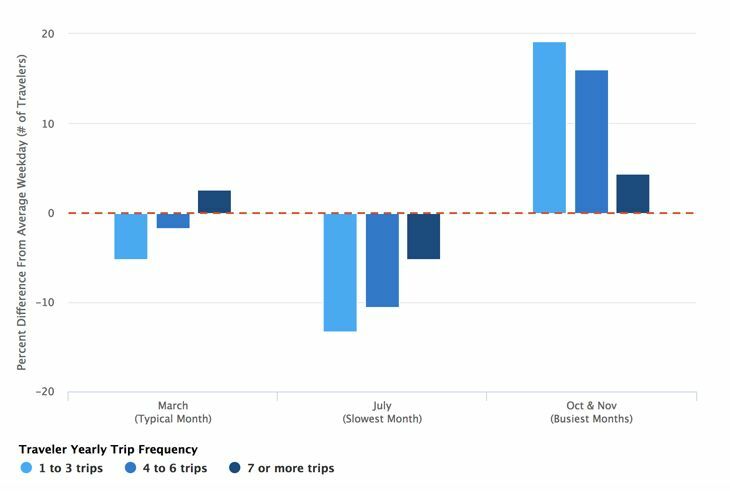 It provides a percentage of the likelihood that a given fare will increase or decrease a week in the future, to help the user make a buy-now-or-wait decision.